It is celebration time for me as I have completed my first year on a food group. My passion for cooking has become more intense and interesting since I embarked on this beautiful journey on this food group. I have learnt and shared a lot. Made new friends who share the same passion and interest and have their own unique style and talent. Inspite of various talents and expertise they share,guide,support and encourage selflessly. I am glad to be a part of this group. My learning journey continues in pursuit of gaining knowledge everyday. 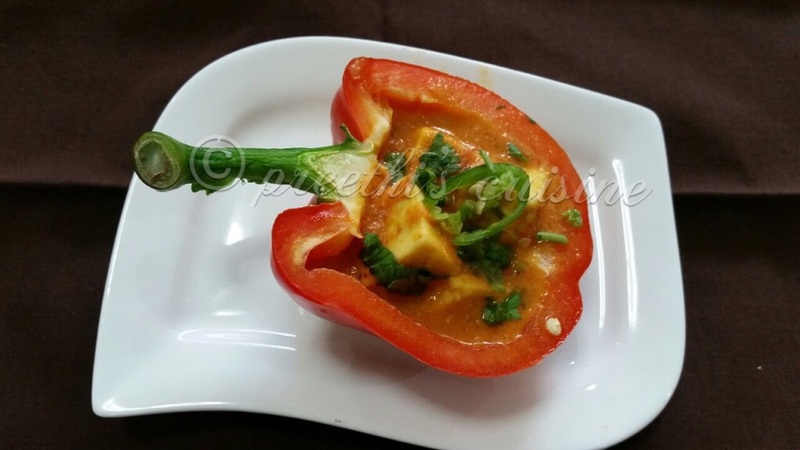 I would like to share Paneer Makhni in Grilled Red Bell Pepper in my style. 25 Cashews – soak in water and grind the cashews to a smooth paste. Heat oil and butter in a Pan. Once the butter starts to melt add bay leaf and saute for 10 seconds till you get the aroma. Add the tomato puree and stir well. Add red chili powder and Kashmiri chilli powder after 2-3 mins and stir again. Saute till the oil starts to leave the sides of the tomato puree in the pan. Add cashew paste and mix well. Saute the masala till the oil begins to leave the sides .Add water and and let it simmer on a low flame. Add slit green chilies, Turmeric and salt and simmer till the curry begins to thicken. Add the paneer cubes and cook them For about 3 minutes .Ensure not to overcook the Paneer. Add Garam masala and Sabji masala and stir well for 4 to 5 mins. Slit the red bell pepper into halves. Grill it for 50 secs to 1 min in a microwave using the grill option. 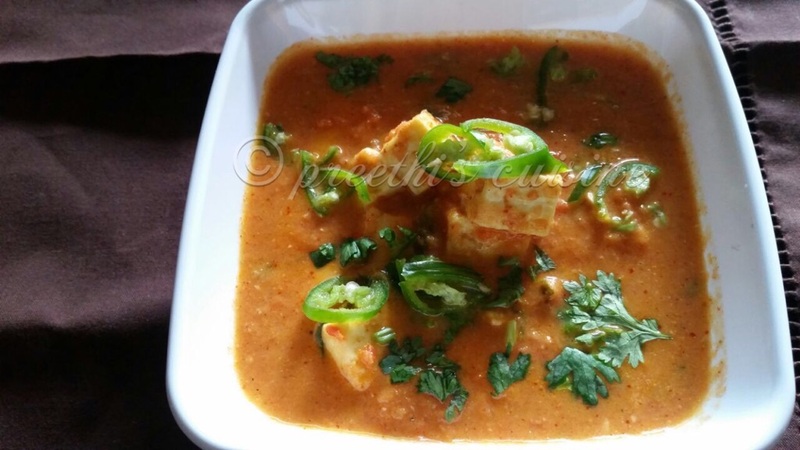 Paneer Makhni is ready. Garnish with chopped coriander leaves and slit chillies and serve hot in the grilled red bell pepper cups with Naan, Phulkas or Simple Jeera Rice. Congratulations on completing one year! Lovely recipe to mark the anniversary. Look forward to many more recipes from you. Very interesting recipe Preethi! Too good! May be you can bake these as biryani cups with a layer of par cooked rice and a layer of paneer Makhani? Thank you Sonal.That sounds interesting. Will try that soon. delicious! Very nice recipes up on your blog Preethi! Many Congratulations and cheers to many such milestones. I loved the creativity here. 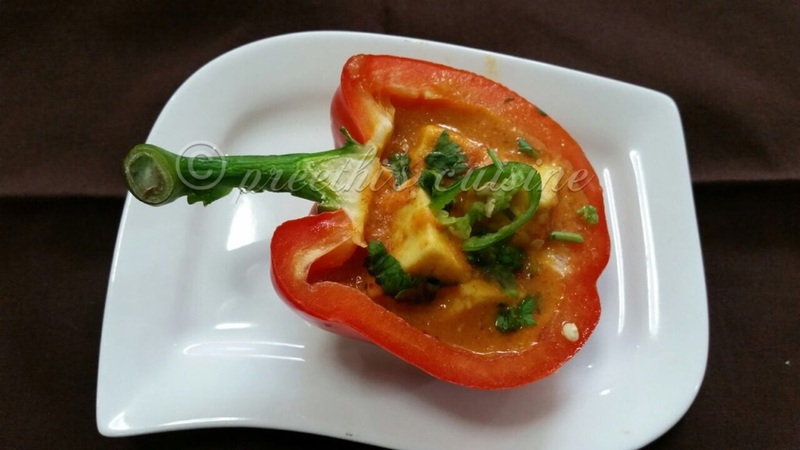 Paneer makhani in grilled bell pepper cups does indeed make for a very interesting party food. It looks so pretty and is sure to be a hit among guests. Thank you Piyali. I am glad you liked it. Cobgratulations! Would love to know which group you are celebrating for? Thank you so much. I had joined Chef At Large. Thank you. Glad you liked it. Do give your feedback whenever you try. Tempting looking dish which is gorgeously presented!